I decided to return to this wonderful event having first taken part last year (see my 2017 blog post). I signed up for this event in the Autumn of 2017, before I had found out that I would gain entry to the London Marathon which took place just 4 weeks prior to this event. With this in mind, I had no intention of pushing myself hard as my body was still recovering from the marathon. In addition to this I wanted to make up for (and learn from) the mistakes that I made last year and make the most of the atmosphere and the beautiful scenery. This year I chose to arrive a day earlier in order to settle in and relax and so I travelled down by train on the Friday morning, arriving mid-afternoon. Upon arrival to Plymouth I made the short walk from the station to my hotel where I checked in and made a quick visit to Sainsbury in order to pick up some supplies for the weekend (bananas, apples, milk, chocolate milk, yoghurts and water). Having learnt from my pre-race fueling mistake last year, I had decided to invest in a portable induction hob, which, along with an induction milk pan I had packed and brought along with me so that I could prepare my usual pre-race (and pre-long run) meal of jumbo oats, raisins, seeds & honey (of which I had weighed and prepared 3 cups for the 3 mornings that I would be in Plymouth). Once back in the hotel I unpacked my case then went for a short, easy run (3.5 miles) to stretch my legs. For the Saturday I had scoped out a couple of local parkruns in advance and decided to run at Mount Edgcumbe parkrun in Cornwall. Although in the neighbouring county, it was in fact a relatively easy and rather enjoyable journey to the event. Firstly, I made the short jog (approx 1.2 miles) to Admiral’s Hard where I was to board a small passenger ferry at 8.15am in order to make the 8 minute crossing into Cornwall. Upon arrival, it was just a 5 minute walk up to Mount Edgcumbe house. 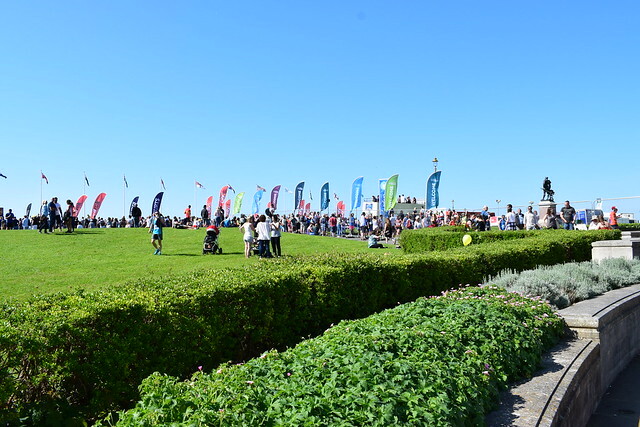 I had done my research and was aware at just how tough the course was going to be, with 438 feet of elevation (only 3 of the other 518 UK parkruns have more elevation on their course) across the 5km distance. Take a look here to see how the elevation of your local parkrun compares. 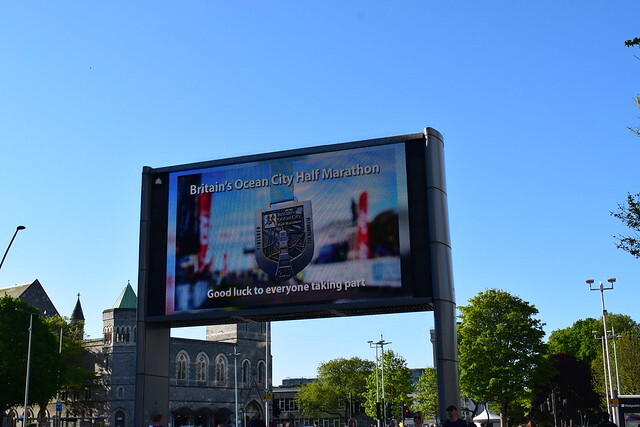 With the half marathon the following day I didn’t want to push myself too hard at the parkrun, although I knew that with the amount of elevation it was likely to take a toll on my body! 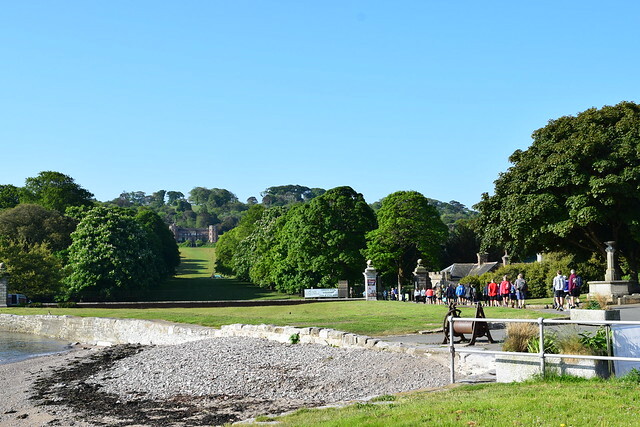 The location for Mount Edgcumbe parkrun is quite truly breathtaking and it is certainly one of the most scenic that I have attended (certainly in the UK). The course starts off on the level but after about 800m you soon commence the ascent to the very top of the course. In fact, the majority of the following mile was uphill! Unforunately, about half way up, the task was made even more difficult when the 5 or so runners immediately ahead of me decided to turn left up one of the slopes (despite the arrow pointing right – I checked that it was pointing in the correct direction on the return descent) – of course, I was not paying attention and just followed the person ahead! At the end of the run my watch showed that I had run 3.3 miles – well at least I got my money’s worth. After the run I took a leisurely stroll back to catch the ferry and then gently jogged the mile back to the hotel. That evening I decided to dine in at the hotel restaurant, which had recently been refurbished, and I decided to opt for a dish similar to that of something I would eat at home, so as not to cause any problems with digestion ahead of the race. I ordered tagliatelle with a mushroom sauce and a salmon fillet but skipped desert! On the morning of the half marathon I awoke before 6am in order to make my porridge (topped with banana) and consume this 2 hours ahead of the race, which was to start at 8.30am. I departed my hotel at 7.45am in the knowledge that I would only need to make the short walk to the start area and drop my bag. 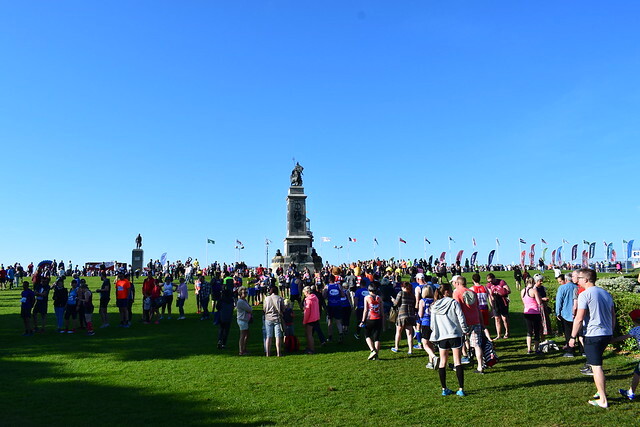 The weather for the race was perfect – dry, blue skies & a comfortable running temperature (certainly a fair few degrees cooler than it had been for the London marathon 4 weeks ago). I made my way into the starting pen and squeezed my way through toward the area which had been marked out for the sub 1:30 runners. My plan for the race was just to take it easy and see how I felt. I decided to run close to the 1:30 pacer for the first mile or so and decided to push on a bit as we made our way out of the Barbican and City Centre. I felt comfortable and was able to maintain a good rhythm. 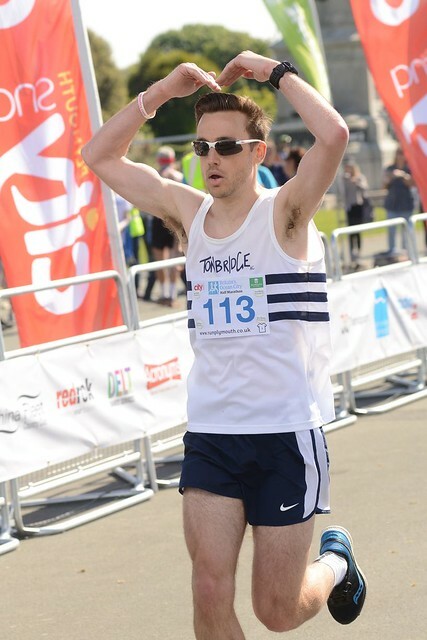 As I had no plans of “gunning for a PB”, there was no need for me to look at my watch during the race. I used my breathing technique to run easy for the first 3 miles, before moving up a gear for the next 4 miles. Once I reached mile 7 I moved up one more gear and maintained this effort all the way to the finish line. I felt surprisingly strong and comfortable throughout and was able to really take in the atmosphere, thanking supporters and volunteers along the way. The final half mile was incredible with the amount of support and despite being mostly uphill, I was able to showboat a little and encouraged the crowd to give me a bit more of a roar towards the finish! I looked around to see no one behind me and therefore resisted the urge to break into any kind of a sprint as I cruised across the line, pulling off a mo-bot in homage to my running hero. I was very surprised and somewhat delighted when I looked at my watch after crossing the line to see that I had finished just 11 seconds away from my existing half marathon personal best (which I set at the Royal Parks half marathon in October of last year), finishing with a time of 1:27.53. I guess it just goes to show what you are capable of if you just listen to your body. I have a few races scheduled over the next few weeks, including my track debut on Tuesday 5th June, where I shall be racing 1500m. After this I have the Staplehurst 10km on the 10th June followed by the Bewl 15 miler on Sunday 1st July. Thanks for reading and please check back soon as I shall be writing a blog post following the RTW runners trip to the London Vitality 10km race on Monday 28th May 2018.